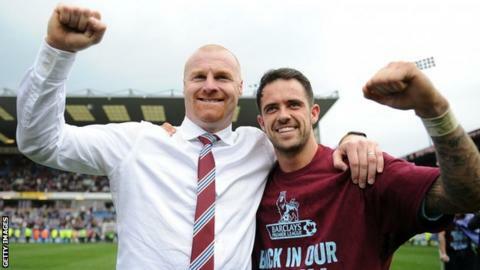 Manager Sean Dyche has described Burnley's promotion to the Premier League as a historic achievement. The Clarets clinched their return to the top division after a four-year absence with a 2-0 win over Wigan. Dyche has spent a transfer fee on only one player - forward Ashley Barnes - since taking charge in October 2012. "To do it automatically having amassed the points we have, with a low budget and using 22 players is incredible. It's a marker in history," he said. Dyche, 42, started his playing career at Nottingham Forest and the centre-back won promotions during spells with Chesterfield, Bristol City, Millwall and Northampton, as well as having a stint at Watford. Was appointed as Watford manager in June 2011 but was sacked in July 2012 after finishing 11th in the Championship. Replaced Eddie Howe at Burnley and finished 11th in his first season before guiding the Clarets to promotion in his first full campaign. Hundreds of fans poured on to the pitch after goals by Barnes and Michael Kightly secured a victory over the Latics at Turf Moor on Monday. Dyche's players were mobbed by many of those supporters and stayed on the pitch to join in the celebrations. "These are great scenes," said Kightly. "The season seems like it's been forever, but we plugged away and the lads deserve it. "Promotion to the Premier League means everything. We were fourth favourites to go down, but the character we have shown has been amazing." Leicester can secure the Championship title on Tuesday with victory over Bolton, but Monday's result meant Burnley can finish no lower than second. Dyche said: "It feels marvellous and like the destination at the end of a long journey - an impressive journey from a group of people who are totally motivated and committed to stand the test of what a season is. "I was promoted four times as a player and I know what it feels like and what it takes as a player but doing it as a manager is an incredible feeling. "To guide a group of people, when I am still learning and developing, is a major achievement for me, the staff, the players and the club." Key to Burnley's success has been strikers Sam Vokes and Danny Ings, who have more than 40 goals between them. The pair made up for the £4m departure last summer of Charlie Austin to QPR. Despite the sale, Dyche was initially only able to bring in free transfers: goalkeeper Tom Heaton and midfielders David Jones and Scott Arfield. In January, he signed Barnes from Brighton for a undisclosed fee, reported to be in the region of £750,000.